You are currently browsing the tag archive for the ‘Neo-Pagan’ tag. I don’t believe this little jewel got much exposure here in the United States. Even after it was nominated for an Oscar for Best Animated Feature in 2009, it still only made it to about 100 screens. It’s a shame, because it is breathtaking. What I liked about the film, apart from the brilliant animation, was the seamless interweaving of Brendan’s Christianity and the pagan natural world that surrounds him. Brendan is the orphaned nephew of an abbot, who continually warns him about the danger of the Wild Woods. Naturally, Brendan escapes the first chance he gets, and he befriends Aisling, a nature spirit. He is not afraid of her. Brendan needs Aisling’s help to subdue a dragon spirit and obtain an eyepiece that will allow him to finish the magnificent Book of Kells. Despite all the respect paid to pre-Patrician paganism in this film, I noticed that Aisling was terrified of the dragon spirit, and it fell to Brendan, the Christian, to subdue it. Oh yes, Pangur Ban, the first among all the cats of Eire, plays an important supporting role as well. At one time, I wondered whether there had been any unbroken tradition of cult or practice between the pre-Christian peoples of Europe and the burgeoning pagan/earth-based religion community that we see emerging today. European paganism persisted longer in the regions bordering the southeastern Baltic than in any other region of Europe, that is Pomerania, Prussia, Lithuania, and Latvia. Strangely,the languages spoken in these areas are very conservative linguistically as well, and are studied by linguists because of the archaic features they preserve that other related languages have long since dropped. In addition to this, I had heard that Lithuanians were never as fervent in their Catholicism as, say, the Poles. For all these reasons, I thought perhaps, just perhaps, in Lithuania there may have existed a living community of pagans who had maintained their ancestral faith down to the present day. Checking through the Internet, though, I found a very familiar pattern; whatever pagan material had survived in Lithuania survived mostly as a constellation of folk practices or “superstitions” the content of which had been forgotten by the people practicing them. Even in Lithuania, which had maintained its traditional paganism into the time of John Wycliffe and Geoffrey Chaucer, Christianity had completely displaced traditional paganism. However, in the 19th century, at the height of the Romantic movement, a literary and cultural movement called Romulva was initiated to restore traditional Lithuanian paganism. It has had a modicum of success, but the majority of Lithuanians remain Catholic. This movement coincided with a resurgence of interest in traditional paganism (Wagner, Swineburne, etc) in other Christian European countries. How did Christianity displace paganism so completely? A lot of historians point to the pressure of belonging to the wider Mediterranean/Roman world. That makes sense for the early Germanic incursors into the western parts of the Roman world, but it makes very little sense for the pagan Saxons and Slavs, most of whom were evangelized by Irish and Anglo-Saxon monastics unaffiliated with any “Roman” power, even the Merovingians who often actively opposed them. As an Orthodox Christian I want to say that paganism was displaced because it was replaced by a superior spiritual force. Paganism has a very pragmatic and empirical side. It worked for the pagans. Pre-schism Christianity had an equally pragmatic and empirical side. 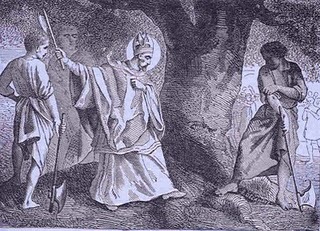 The hagiography of that era is full of what we could call “power encounters” between the old ways and the rising power of Christ, such as the battle between Saint Patrick and the pagan king Laoghaire on the hill of Slane. Bede is full of this sort of story, and I am more disposed to believe Bede as a journalist than as a propagandist. If paganism was the veneration of the “elemental spirits” of the world, then the Church was right in replacing the cultus of the pagan gods with the veneration of Christian saints. Mankind was “coming into its own” under the tutelage of the Church, and the elemental spirits were being put out of a job. The saints were taking it over. In a way, secular scientism could be seen as an outgrowth of this development. That leaves the explanation of the emergence of modern neo-paganism, even amidst the triumph of its successor secular materialism, as a rebuke to a denatured, splintered Christianity that has lost its spiritual mojo. For an Orthodox Christian, I sometimes think I have altogether too much sympathy for other religious expressions, especially Taoism or Sufi’ism and others of that stripe which concentrate on the immanence of God. Pantheism is a continual temptation for me, so you can see where I would find neo-paganism attractive in the abstract; first, neo-paganism purports to be eco-friendly, venerating the biosphere, that Web of Exchange which is the living, breathing skein of our planet. Then, neo-paganism purports to honor Tradition and Ancestors, and I have always believed that anything built up by increments over millenia as a result of mostly unconscious impulses has to contain something of value, and anyway is always to be preferred to a system created by a group of Really Smart People using their brains to Figure Things Out. As an aside, Arturo Vasquez deftly captures something of what I want to say in a post of his, The Modern War Against Folk Religion. Take what he has to say to heart, all you people with the highly developed frontal lobes, the next time someone passes you on the highway with the Virgin of Guadalupe garishly splashed all over his back window, and remember the Wahabi. However, on the ground, I am finding that “neo-paganism” is becoming a favorite feint of the “spiritual-but-not-religious” crowd, a means to continue their undiluted worship of their own reflections while avoiding the inevitable demands a god would make on them. Now, Neil Gaiman strikes as close as any living writer I have read to the mythopoetic spirit of the Inklings (I haven’t yet read Tim Powers or Gene Scott). OK, so he’s a horror writer. To anybody who isn’t sufficiently anesthetized, our age must seem an unending horror. Indeed, I don’t think you could possibly write mythopoetic literature, have it accurately describe our present spiritual circumstances, and not descend into horror. Nevertheless, Mr. Gaiman deftly dispenses with modern American Wicca/neo-paganism in this scene from American Gods. Please forgive the format. My daughter borrowed my copy and there obviously isn’t a soft-copy version of a best-selling current novel available for cutting and pasting. But thank God for books.google and FastStone Capture. Mr. Gaiman, if you stumble across this insignificant blog, I invoke the Fair Use clause, and want to thank you for a fascinating and thought-provoking read. Also, if you are a neo-pagan who has wandered in here and are offended, leave a message and let’s try to be friends.